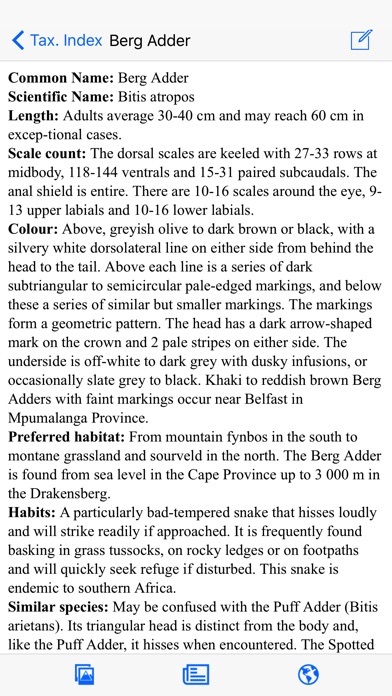 ** If you would like to experience the app check out eSnakes of Southern Africa LITE which is FREE and includes 20 species ** This interactive version of Johan Marais’ A Complete Guide to the Snakes of Southern Africa is an essential field guide for those visiting and living in the region with an interest in its snake species. 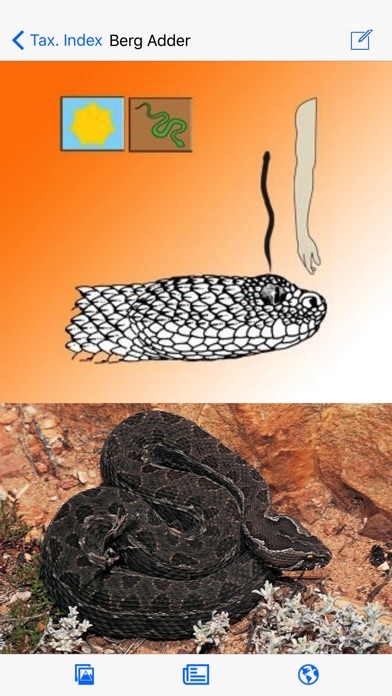 It covers all 151 snakes indigenous to Southern Africa. FEATURES: Images, distribution maps and text descriptions of over 150 species found throughout Southern Africa. Multiple photographs allow for easier identification. 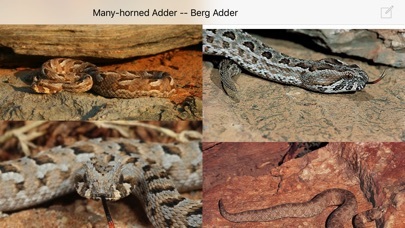 A “Smart Search” that allows you to easily identify a snake species using head shape, type of scale and habitat. 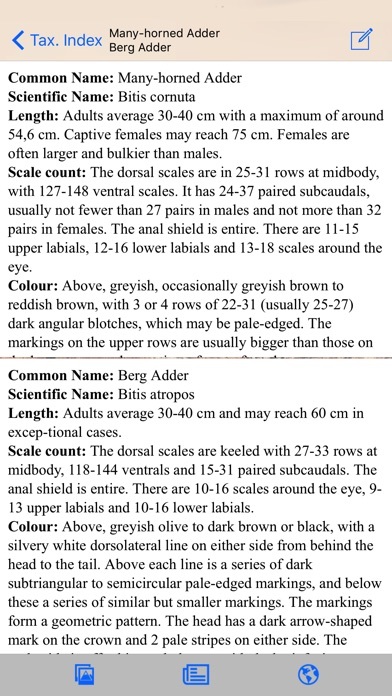 A “Compare” feature that allows you to compare two species on the same screen A personal species list that stores your snake sightings saved to the device* (can be exported and emailed in CSV format) *Uninstalling the program will result in the loss of your list, it is recommended that you keep your own backup (master list) separate from the program. For more wildlife guides see our other apps: Sasol eBirds, Wildlife of Southern Africa, eGuide to Mammals of Southern Africa, Kingdon Guide to African Mammals. NB. This Application WILL ONLY work on an iPhone/iPod Touch and iPad running OS V9.3 or higher NOT A NORMAL IPOD CLASSIC/NANO. The information is fairly extensive but the screen shot is iPhone size and makes reading on an iPad frustrating. This significantly diminishes the experience.